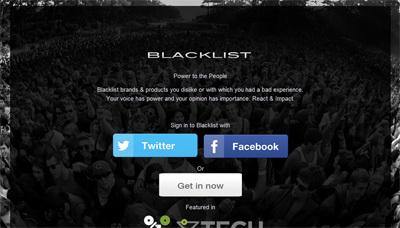 Blacklist is the powerful megaphone for people to react after a bad consumer experience to get their voice heard. Started in 2012 by Val Lefebvre from a personal frustration of no easy way to react after many dissatisfying consumer experiences, the concept positions itself as a destination on the web deployed across platforms that leverages the voices of individuals and their reach to impact accordingly. Blacklist’s innovative, yet disruptive solution offers the power to the people to express themselves on their brand experience. The aim is to ease the consumer feedback anywhere and anytime to bring brands closer for a more aligned interaction. Blacklist breaks the barriers of digital feedback and gives the power to the people by making it easy, fast and simple to react. Brands and companies on the other side will have the new ‘Defensive Marketing’ opportunity to listen, and engage with people talking about them on the platform. The vision is to bring more transparency between consumers-brands, for more aligned interactions.